Cittadella is a town in the north-eastern part of Italy. 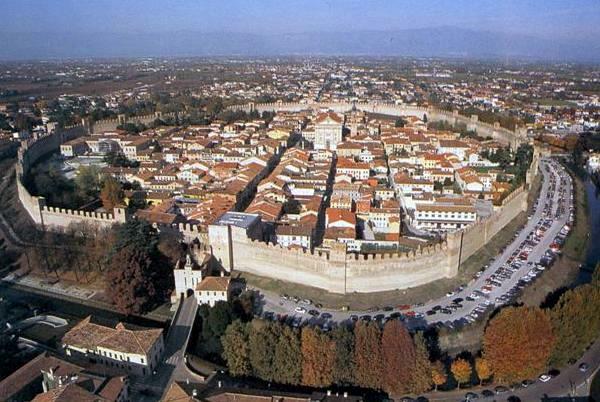 The town centre is enclosed by a 13th century tall circular wall, 12 meter high and 1461 meter long, studded with 32 towers. That is one nifty looking city. Although I'm unsure how well the parking lot moat will do in keeping out attackers. Perhaps it is meant to keep the invaders circling looking for an open space until they weary and leave. It’s great how 12th century city planners already had visualized the solution for 20th century parking problems. It’s all about long-term planning!